The upper river bottom of Big Cliff Reservoir just below Detroit Dam on the Santiam River in the central Oregon Cascades is a serious business, no screwing around SCUBA diving site. Don’t get us wrong, this is a fun site to drift dive, but it is also a very demanding site where you can easily get caught in an underwater obstruction and drown. For this reason, this is a site that you need to be prepared to dive and be willing to accept the risks of the site. The main highlight of this site is doing a high speed drift dive down the river bottom. There aren’t many places that are deep enough to blast down a river at breakneck speed. Dodging sunken trees and huge boulders is great fun (although quite dangerous). There are some deep potholes that you will most likely get sucked into and spit out the other side after swirling around inside a few times. We don’t know if there are any underwater caves or pinch points that you might get stuck in but we would not be surprised if there are. This site has some significant risks that you need to be aware of and willing to accept. Detroit, Oregon is up the road from Big Cliff at the top end of Detroit Lake. Heading east on North Santiam highway, look for the right turn toward the top end of Big Cliff Reservoir. The last time we went diving here a couple years ago, there was a sign for Detroit Dam but this may have been removed since then. We park at the old boat ramp next to the big metal electrical transmission tower. There is another parking area up toward Detroit Dam on the access road that we have used to stage gear before leaving the car at the lower exit. Imagery ©2017 Google, Map data ©2017 Google. The upper river at Big Cliff Reservoir is an exhilarating dive site but it can kill you. You just follow the river down. There isn’t much else to it. Along the way you will encounter rocks, logs, big washtubs and potholes in the rock, and a bunch of other stuff that blazes by in the blink of an eye. We usually enter at the entrance farthest up the river just above the bridge. However, due to national security concerns, this area may now be closed off or could be closed off at any point in time. There is another good place to enter and a good place to exit early just below the bridge at a pull-out. If push comes to shove, you can exit just about anywhere along the river if you don’t mind scrambling up a steep bank. You can also float along the surface until you reach the lower exit and your car. The lower exit is at the old boat ramp and the big metal electrical transmission tower. We have tried putting out a line underwater here so that we know when we need to surface but we seem to never manage to see the line. Instead, watch your depth and surface when you hit around 50 feet (this depends on the Big Cliff Reservoir water level though). If you blow past 50 feet, you’ll be heading into the lower dive site on Big Cliff Reservoir. The whole point of this site is the incredible current. You cannot fight against it. All you can do is follow along. The potential for underwater obstructions that can entangle and drown you is very real at this site. Be darn sure of your skills and ready to accept the very real risks before you jump in here. We are very skilled divers with experience diving all over the world and thousands of dives under our collective belts, and this site scares us. You will almost certainly lose your buddy underwater unless you’re holding onto each other. Be prepared and have a plan for what to do when you separate. Taking the time to surface (which you should do unless you are certified to solo dive) will eat up a lot of river distance due to how fast the current is. Water conditions change rapidly and drastically here based on what Detroit Dam is doing. There is no warning for changing water conditions. Although if you hear a big alarm klaxon, that may mean Detroit Dam is suffering some sort of breach or failure and you’re about to be swept way downriver in a flood. That probably isn’t going to happen while you’re diving here though. We usually get 5-10 feet of visibility here. It is dependent on the water quality exiting Detroit Dam upstream. Water temperature really varies here based on what Detroit Dam is doing. Usually it seems the water is between 45 and 65F. We don’t know if there is a better time to dive here or not. We have only gone to this site a couple of times in the spring and summer. During those times, conditions were acceptable for the level of risk we were willing to take. Most of the way along the river, you will be between 15 and 25 feet deep. In potholes, you can hit 40 feet briefly. At the bottom end of the site, you should surface before you hit 50 feet so that you don’t end up way down at the bottom of Detroit Lake. Anything less than a rescue diver certification and extensive experience with drift diving and underwater hazards is really asking for trouble at this site. Even with that training and experience, this site is still risky. If it weren’t for the very real danger of being pinned under a log or against a rock where you will slowly run out of air and then drown, this would be a fairly straight forward and easy dive. Because of these very real risks, you need to be in peak physical condition and be a very experienced diver. 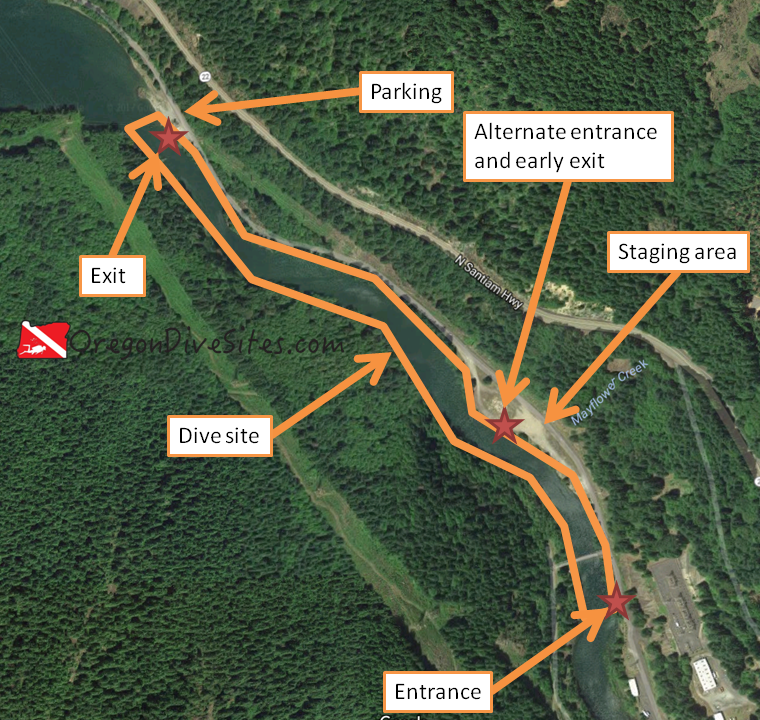 Depending on where you park, if you drop your gear off upriver, and if you choose to enter at the middle or upper entrance, you could be walking anywhere from 50 feet to 2400 feet. There is no surface swim here. Swimming against the current is normally impossible. This is a no screwing around dive site. There are many things underwater waiting and eager to grab and drown you thoroughly dead. Get some serious training and serious experience before you attempt this site. We suggest taking a good dive light so that you can at least read your gauges in some of the deep, black holes. We have several dive lights that we use every time we dive in Oregon and highly recommend at the Gear We Use page. There aren’t any close dive shops up here. The closest shop is in Salem. Detroit has a few small restaurants that are decent places for a meal. There are several federal and state campgrounds nearby and plenty of primitive camping in the national forest. We haven’t tried any of the hotels or cabins in the area. Please let us know if you know of a good place that is SCUBA friendly!